A few days ago, The Seven Deadly Sins: Prisoners Of The Sky dropped on Netflix in English Sub and Dub, and finally gave me a chance to watch it. Instead of reviewing this like I would an anime, I’m going to review it like I would a movie. My thoughts and feelings about this movie can be summed up in one sentence. The Seven Deadly Sins: Prisoners Of The Sky reminded me of everything I love about the series. However, despite this there are a few glaring issues with the movie, which I will get into first, before moving onto the good things. To start off, the biggest issue with this movie is the timeline. As far as I can tell and have researched about is that the events of the movie don’t seem to take place in the main timeline, as it would not fit with the canon events. In the movie, Escanor is present, and Meliodas has his Demon mark (but not his full form) meaning that it takes part after Season 2; however, Gowther’s season 2 arc has not happened and Diane and King have not had their full power up, and Elaine is not alive as well as the fact that the Ten Commandments don’t seem to be around. Therefore, I have had to draw the conclusion that it does not take part in the main timeline. Second of all, the villains in the movie are far overblown and aren’t as much of a problem as they are made out to be. The Six Knights Of Black are made out to be just as strong as the Ten Commandments; however, they clearly are not. Despite being explained as one of the strongest groups in the Demon clan, the Sins don’t have many problems in dispatching them, and their leader, Bellion, seems to be accurately powered allegedly being as strong as four of the commandments. He is the only of the Six Black Knights who prove to be an issue for Meliodas but as soon as he releases his Demon mark he annihilates Bellion in one of the greatest fight scenes I have ever seen. And thirdly, this is something I don’t really have a personal issue with, is that the characters don’t really develop much over the course of the movie. This isn’t a big issue, just something worth mentioning. And of course, the fact that Hawk Mama is a badass just didn’t make sense to me, but it was hilarious. However, that does make me more interested in her backstory, given what was recently learned about Hawk in the manga. Now onto the good things. Let’s start with the voice acting. As always it is spectacular and Yuki Kaji delivers another amazing performance as Meliodas. The soundtrack was amazing as always and the classic Seven Deadly Sins action sequence soundtrack is just as incredible as always, being on par with You Say Run for me. Perfect Time is just… well perfect! Especially when it comes on in the Meliodas Vs Bellion fight, you just know what’s about to go down. The other fights were great too but not as good as the two final ones as the Sins absolutely destroyed and ridiculed the Six Knights Of Black in a spectacular fashion. Especially Merlin, Escanor and Ban. The plot/story of the movie itself is not that important but is a nice addition to the world of Nanatsu No Taizai, building on the backstory of the world and adding to the dimensions regarding the world that we already know about, with the Celestials. I would like to see them used in the main timeline in some sort of manner, especially considering that the entire plot only happens because there are some celestial duplicates of Meliodas and Elizabeth. A bit convenient I agree, especially considering that they are together as well, but nothing that was a deal breaker for me. The Seven Deadly Sins: Prisoners Of The Sky is a great addition to the Nanatsu No Taizai universe and reminded me of everything that I love about the series and why it is my favourite. The movie is not without some glaring issues regarding the villains, timeline and the lack of character development, which isn’t a big problem as they are incredibly well developed and established in the universe, but the positives majorly outweigh the negatives. 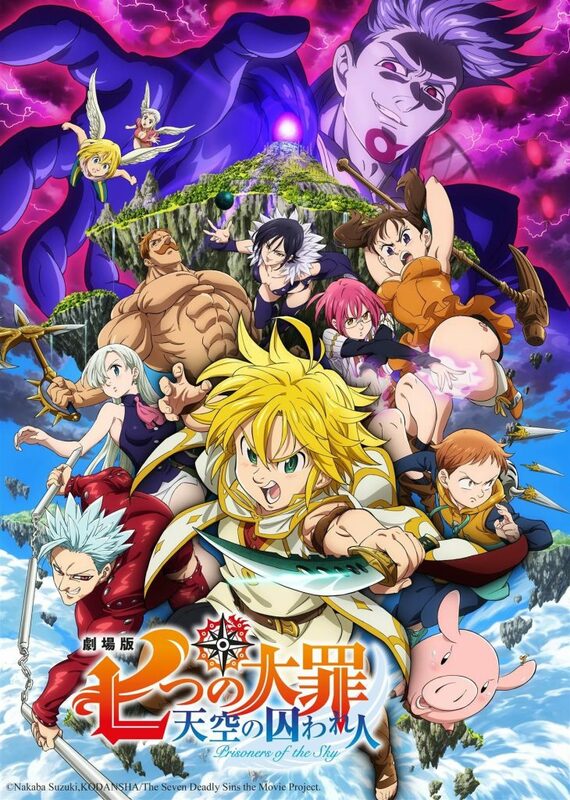 The spectacular action direction and soundtrack are mind-blowing and were the best part of the movie, in regular Seven Deadly Sins manner as well as the excellent voice acting. I would love to see the Celestials involved in the main plot of The Seven Deadly Sins and would definitely recommend that you go and watch the movie if you are a fan of The Seven Deadly Sins (or if you watched it). If you haven’t watched or read Nanatsu No Taizai, I highly recommend doing so as it happens to be my favourite anime/manga of all time. Check out what my top 10 best anime of 2018 were here at this link! I believe other website proprietors should take this site as an model, very clean and superb user genial pattern.